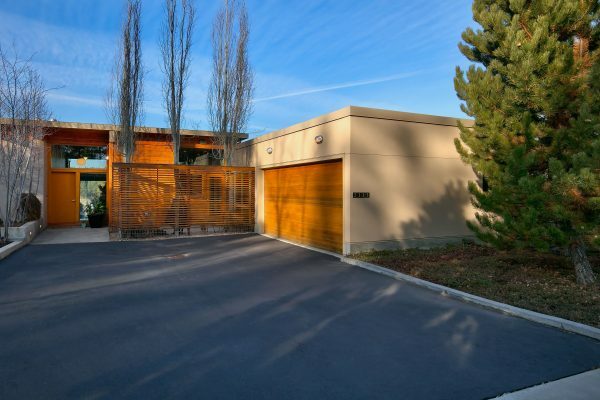 Single level living in NW Bend with zero exterior maintenance. 23′ window wall with staggering views of Mt. Bachelor, Broken Top, & Three Sisters. Stainless steel kitchen counter tops and appliances, honed granite counter tops, walnut hardwood floors, wool carpet, and every detail you’d expect with genuine modern design. Concrete floor with radiant floor heat, passive solar, built-in desk/work station, gas fireplace, central AC. Address: 2237 NW Reserve Camp Ct.